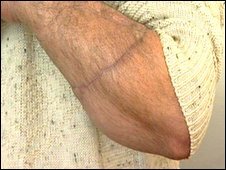 An East Sussex man who chopped his left arm off with a chainsaw has described having it re-attached as like "winning the lottery". John Stirling was cutting wood in his garden in Telscombe Cliffs when the accident happened in September. He was taken to the Queen Victoria Hospital in East Grinstead, West Sussex, were surgeons carried out a 14-hour operation to save him. Mr Stirling can now move his fingers and has been back to work. He said: "It's unbelievable actually. I can now move my fingers, which to me after 11 weeks is amazing. "Obviously it's nowhere near how it was before I cut my arm off but to be sitting here at work after 11 weeks, it's a miracle. I am delighted." 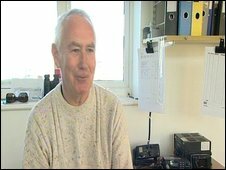 Mr Stirling added: "I look back and I try to put it [the accident] out of my mind. I concentrate on the positive. I'm very lucky. It's like winning the lottery. I'm a very lucky man." It is thought the chainsaw slipped, leaving Mr Stirling with his arm cut off below the elbow on 29 September. He knocked on the door of neighbour Steve Francis who dialled 999, tied a belt around the arm and kept the rest of the limb in a bag of frozen pastry. Mr Stirling's daughter, Suzanne Smith, said: "It was so horrific. I'm so glad I got my dad back. It's wonderful the work that the hospital have done. It's tremendous."